Lloyd's Rides, Inc. is a registered charity in the state of Pennsylvania (USA). Our mission is to give rides on Motorcycles or in Hot Rods, Limousines, Classic Cars, etc. to mentally challenged people and wounded warriors. 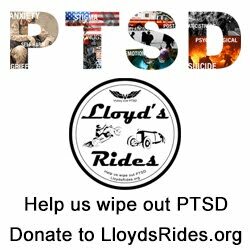 If you are interested in giving a ride, or in creating your own local chapter of Lloyd's Rides, please contact us.